Inform your potential students about your educational programs in a stylish way using SkIllum theme. 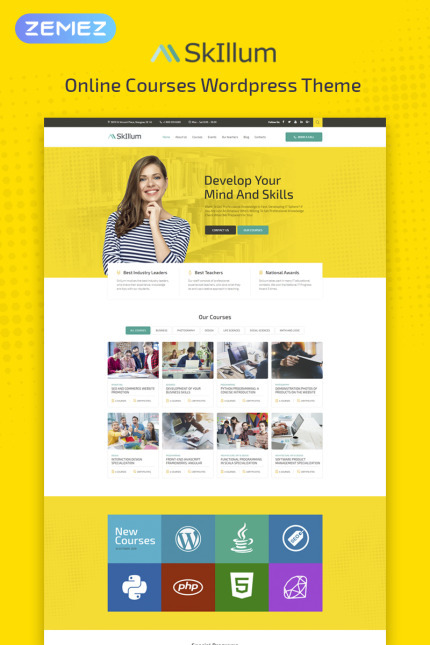 Engage more people to enroll in your online courses with a bright design of the theme. You will customize pages' layouts and represent the content in a stylish form thanks to the theme’s functionality. It is equipped with a powerful Jet plugins bundle for Elementor page builder. You will be able to enrich your content with attractive elements and customize their appearance using JetElements plugin. With JetThemeCore plugin you will get an opportunity to select pre-styled sections and even ready0made entire pages concerning your topic and add them to the pages in a few clicks. JetMenu plugin will allow building an extraordinary mega menu with drop-down sections and style up them according to your taste. You will add informative blog posts with marvelous elements on your website using JetBlog plugin.It will be possible to present the content in a creative way using tabs and accordion blocks with the help of JetTabs plugin. You will be able to make your site more vivid and catchy using animation effects of JetTricks plugin. Online Courses theme is a fully responsive and has a good-structured interface. SkIllum will help you expand your client base and attract new students to your courses.